There are more unknown and talented artists in the world than there are known ones. At least that’s how I feel– because I’m one of the unknowns. We strive to get our work out there to be seen by others, but we often are overlooked. I went to a certain park downtown and set up my artwork in hopes of selling a few pieces. About 10 minutes after I got there I was escorted out of the park by security who treated me as some sort of Artsy Criminal. Yet, after years of many of us holding back and having limited opportunities to display our work and sell it in public, someone finally did something amazing. In the summer of 2007 an idea was born inside the walls of the City Arts Factory that would breakdown the limitations of us artists. They called it, The Orlando Art Farm. The Originators, Chuck Dinkins and Amanda Vickers are two well known artists in our community who have been involved in numerous causes and movements in Orlando’s Art movement. Amanda is a self-made artist that has been showing and selling her work at various places including Cafe Tu Tu Tango, the original Orlando farmer’s Market and Wall Street Market. Amanda has also been involved in large organizations such as Make an Impression Visual Arts program and The International House of Blues Foundation, where she met Chuck. 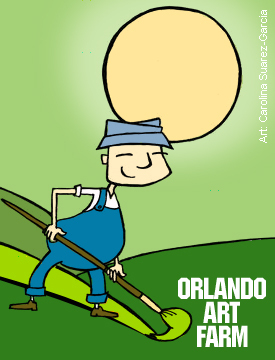 At the same time, she worked as a volunteer coordinator for OVAL (Orlando Visual Arts League). Chuck Dinkins, a musician at heart, saw success as a painter in his days working at Sapphire Supper Club, later on in his life he worked as a talent buyer for the House Of Blues. He left HOB after the LIVE Nation buyout to become the General Manager/Facilities Director at 29 S. Orange Av. when it reopened it’s doors as The City Arts Factory. Together, Chuck and Amanda brought life to and opened the arms of the City Arts Factory to all artists alike. Just as the City Arts Factory was going through a rebirth, the Orlando Farmer’s Market was appointed a new director, Dana Brown. She is a woman with a long history of event planning and music booking in Orlando. Dana attended a DAD (Downtown Arts District) Meeting to introduce herself in her new position. There she met Chuck who brought forward the idea of a collaboration with the Farmer’s Market. So after a few lunches and a lot of political red tape, the Art Farm was born. They came up with the concept of a monthly event that for a very small fee, allows artists to set up shop in Downtown Lake Eola for a full day and sell their handmade goods to the passers by. The Art Farm sits adjacent to the Orlando Farmers Market therefore creating a big bountiful event for the locals and visitors alike. The Art Farm sets up Art Festival Style along the bridge and fills it with a diverse group of visual artists that sell unique handmade works ranging from paintings, jewelry, candles, magnets, large marble pieces, mosaic art, henna, folk art, industrial art, pottery, illustrations and handmade greeting cards. Along side is the Orlando Farmer’s Market which offers a vast array of goods including locally grown produce, exotic ornamental plants and annuals, handcrafted gifts, jewelry, and house wares, luxurious aromatherapy products, and boutique style pet notions. Fresh gourmet and ethnic foods can be enjoyed in a shady, open-air restaurant/ beer and wine garden, or brought home to complete the perfect Sunday dinner. They also feature live music, art and portraiture, pet photography, and licensed chair massage, all in a family and pet friendly environment. Today, the Art Farm continues to grow and is becoming a permanent fixture in our local arts open to the public on the Third Sunday of every month from 10am-4pm. The Orlando Farmer’s Market is open every Sunday from 10am-4pm. So from all of us unknown artists, we thank these great young minds that with their ideas, perseverance and hard work continue to open doors for the many artists that are simply looking for a way in. Carolina Suarez-Garcia is first, a visual artist. Along with her love of art, comes a love of writing that she’s nurtured all her life. Born in Lima, Peru, she’s lived in Orlando since 1994 with her husband and toddler son. Read her article, Parents of a Stillborn Child, here.